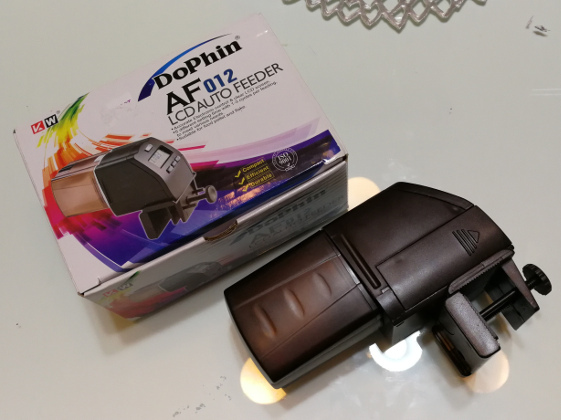 Automatic Feeders for Fish – A review of the AF012 LCD Auto Feeder | My Goldfish Is Alive! 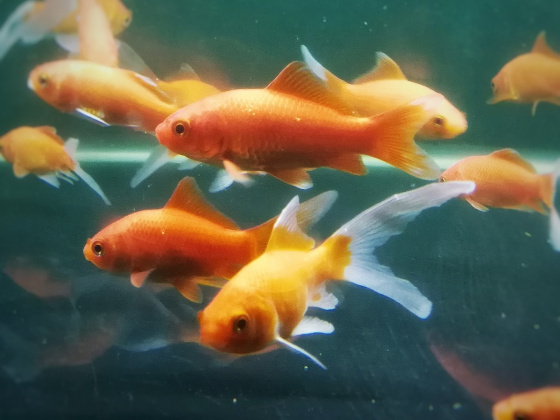 Besides keeping a clean and safe environment for your goldfish, you need to feed them regularly and with food that provides them with the necessary nutrients. This may sound a little silly, but I do feel that feeding time is when you get to bond with your goldfish. Anyway, I do think you should feed them manually, as this will make them more interactive with you. However, there will be times when you can’t feed them manually, for instance when you are away for business, holidays, etc and you do not have anyone to help you with that. Not everyone has family, friends or a fish-sitter whom they can entrust this important task to, right? So this is when automatic feeders for fish come in handy. There are many options for off-the-shelf automatic fish feeders and they all share the same mechanism on how they work. In general, you set the timer and put the fish food into the container provided. The container will have an outlet. 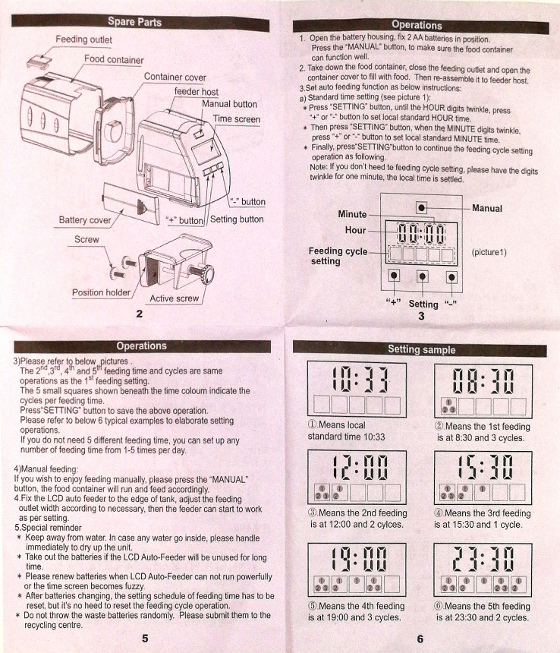 When the time is up, the timer will operate a motor that rotates the container. 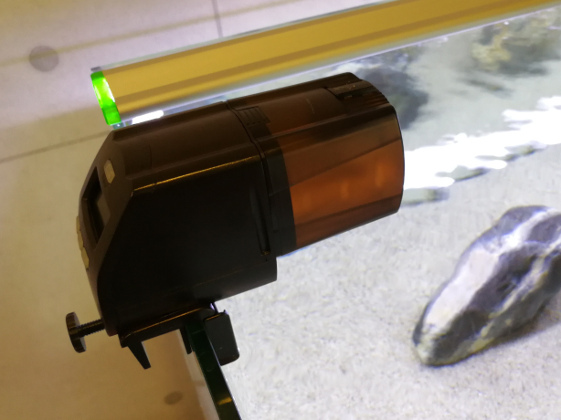 As it is rotating, the food will fall into the outlet and get released into the tank. 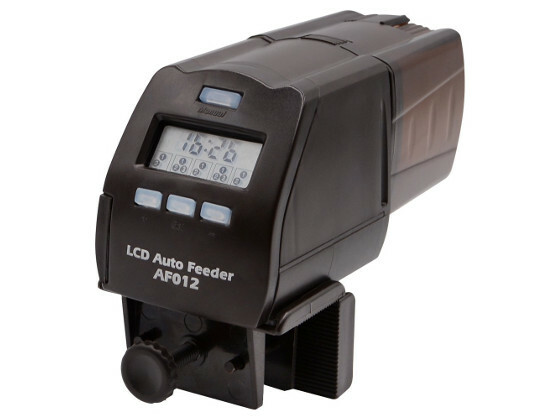 Well, what set the automatic feeders apart are the overall design and the flexibility of controlling when and how much to feed… and these are exactly why I am using the AF012 LCD Auto Feeder. This automatic feeder is powered by 2 AA batteries (not included in the package). They can be easily installed on the side of the product. There are 2 feeding modes – manual and auto. For manual mode, there is a Manual button at the back of the automatic feeder that you press to release the food immediately. For auto mode, you can set up to 5 feedings per day, and up to 3 cycles (i.e. how many times the food get released) in each feeding. Setting this up may seem complicated at the beginning, but if you follow the instructions provided by the Operations Manual, you will get a hang of it. The LCD screen is placed at the back of the automatic feeder rather than at the top. This makes it more accessible especially when you have a tall tank or when your tank is placed in a higher location. 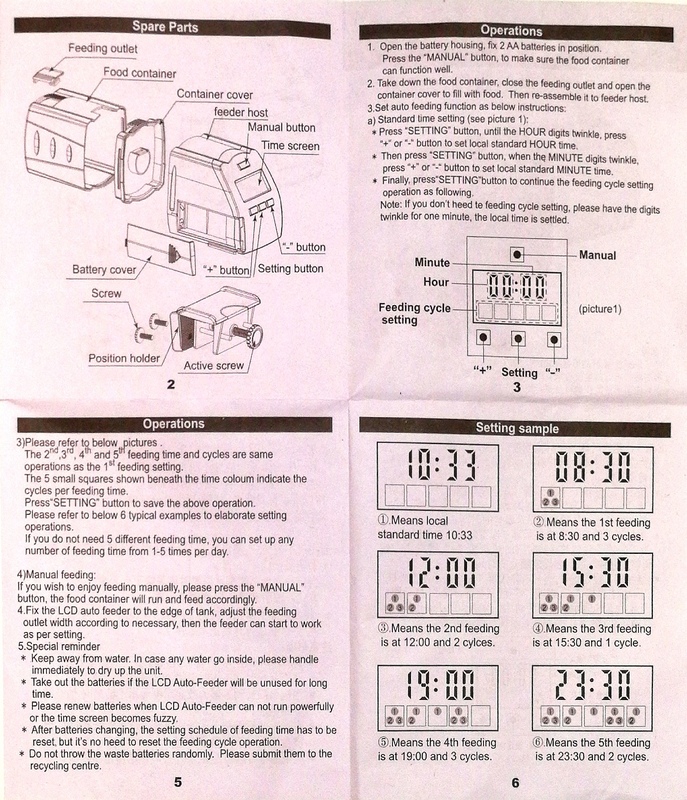 If the LCD screen is placed at the top, it will be more difficult to see it and to adjust your timer settings under these circumstances. The food container on this automatic feeder is quite big as compared to other products. Its dimensions are 2.7″x 2.3″x 2.2″ which comes up to 150ml of space for your dry fish food (pellets & flakes). 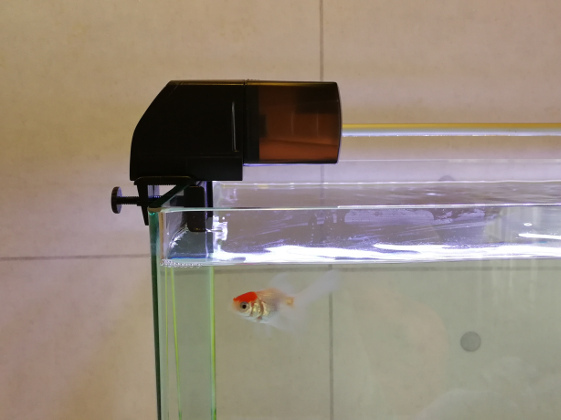 The more food you can contain there, the longer your automatic feeder can help feed your goldfish (with the condition that it did not run out of battery power first). It is also very easy to take out the container’s cover and to reattach whenever you need to replenish the fish food. Besides that, there is an adjustable food outlet for you to decide how much fish food will be released each time. The food outlet can be adjusted up to the maximum of 0.7″x 0.55″ opening. When the automatic feeder is installed to your fish tank, the food container is slightly slanted downwards. This is to ensure that the fish food in it move towards the outlet and get released when it’s time. Don’t you think these are great features to have for an automatic feeder? The biggest risk with using automatic feeders for fish is overfeeding. Overfeeding causes the water quality to deteriorate very quickly and brings harm to your goldfish. Most of the time, overfeeding by these automatic feeders are caused by malfunctions and mistakes in setting them up. If you have been feeding your goldfish regularly, they can usually go without it for up to 2 weeks. So if you are going to be away just for a few days, you can just leave them unfed during this time. Always use dry fish food such as pellets or flakes with automatic feeders. Soggy or wet food will clump together and will stick to the food container or block the outlet. Worse case is when a big clump falls into the tank. When adjusting the food outlet, set it to release less amount of food than you will normally feed. Always check that the batteries are still working well and that the outlet is adjusted correctly to release the right amount of food. Install this to your fish tank and start using it a few days before you go on your vacation, business, etc. This is to make sure that if there’s any problem, you get to know about it immediately and are still able to rectify the problem. Do let me know if you have any thoughts on automatic feeders for fish by leaving them in the comments section below. 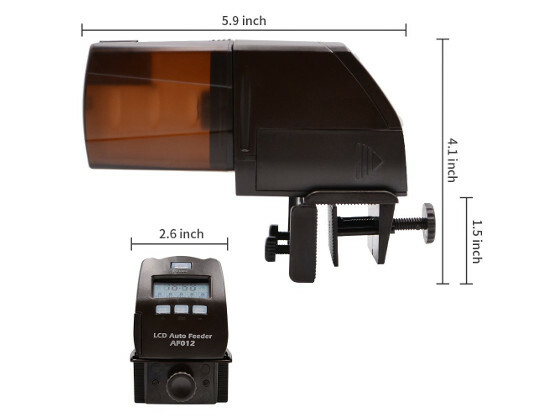 If you have used AF012 LCD Auto Feeder before, do share your experience using it. But what about if you are away for more than 5 days how are you going to do the water change if you have no one to fish sit. Can you share your experience on this, thanks!! Thanks for the question. For me, I would do a water change a day before I travel. While I am away, I usually will depend on automatic feeder to feed a lesser amount of food than I usually feed when I am home. 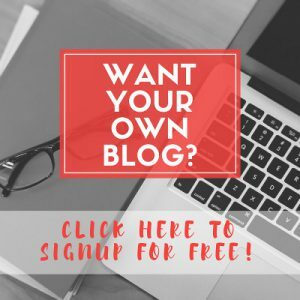 Please check out this post on my thoughts about using automatic feeder. If my travel is less than a week, I may also just not feed them. Don’t worry, if you have been feeding them consistently, they can survive without food for a few days. Less/no food during this period of time will mean less wastes as well, so the water quality will not deteriorate so fast. What a great idea!! With this automatic fish feeder I will be able to stay out of home for more time without be worry about my fish! Thank for sharing this important info. Thanks Tiana. Indeed automatic feeder when set correctly can really be helpful for us when we have to be away from home.